In the town of Coronach, a large grain elevator sits in an open field. A large grain elevator sits in an open field in Coronach. A dirt road leads up to the grain elevator. 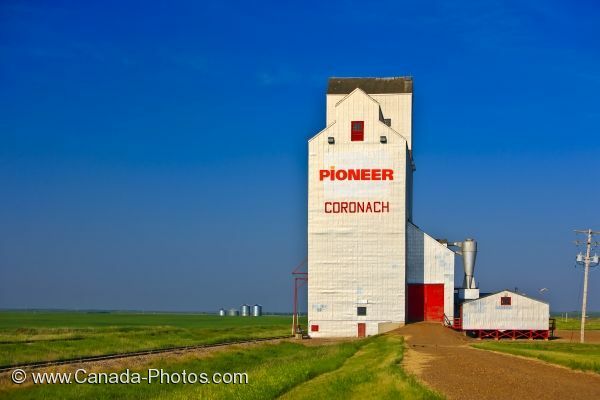 Painted in large red letters on the building is "Pioneer" and "Coronach". The town of Coronach is part of the Big Muddy Badlands in southern part of Saskatchewan. Grain elevator in the town of Coronach in the Big Muddy Badlands region of Southern Saskatchewan, Canada. A grain elevator sits in a large open field in the town of Coronach, Saskatchewan, Canada.